If the name of the place doesn't answer the questions of where and why regarding the Whistle Post Brewing Co, perhaps the passing of a train will help you connect the dots. For the area's newest brewery is named for a sign that sits along tracks running past Whistle Post's northern elevation. 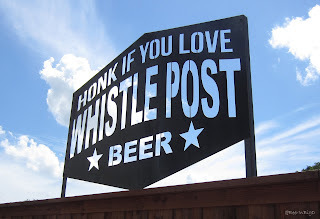 And, while a "whistle post" advises an engineer to blow a train's horn as it approaches the nearby street crossing, a separate sign suggests the honking is to signal a love of Whistle Post beer (ergo the image above). Located in Pilot Point, Whistle Post is owned by those behind the city's Western Son Distillery. In fact, the two businesses sit next door to each other, which makes it convenient for owners Evan Batt and John Straits to oversee the operations of what amounts to a small-town neighborhood drinking destination. 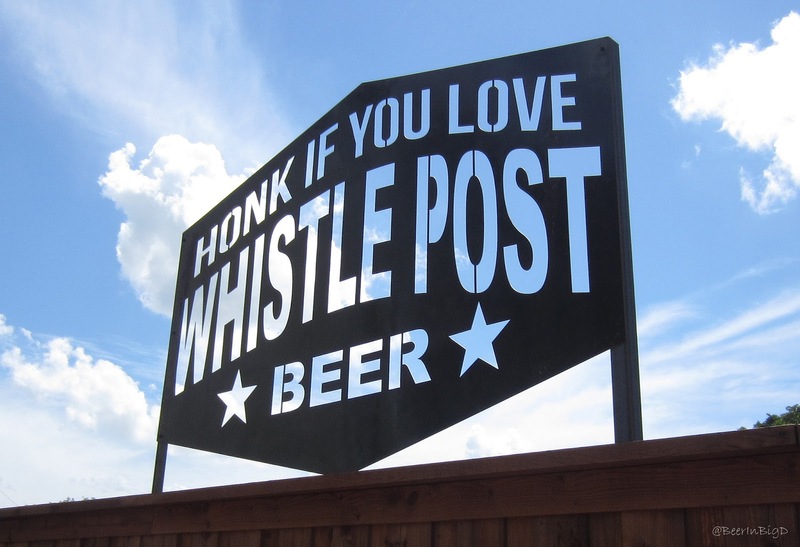 The pair relocated Western Son (originally known as JEM Beverage, Co.) to Pilot Point from Carrollton in the middle of 2015, but this past weekend was the official grand opening for their Whistle Post project. In terms of brewery particulars, the 5000 square foot building that houses Whistle Post was built from the ground up. A climate-controlled taproom occupies less than half of the area allotment, with production space taking up the rest of the available room. It's there that brewery's beers are currently being made on a pilot system, though a 20-barrel brewhouse is said to be on the way. Left: Whistle Post's outdoor amenities include a deck, picnic table seating and frequent train fly-bys (look above the fence). Right: The brewery's pilot system will supply the taproom until a new 20-barrel brewhouse is delivered. Running things on the brewery side is Blake Morrison, who formerly worked as an assistant brewer at Cedar Creek in Seven Points. His opening day lineup consisted of 10 beers, each derived from one of four different baseline recipes. Starting from his Texas Pale Ale, Morrison prepped both a grapefruit and peach version of that beer, while variations on his Shoofly Golden Ale included one with lime and toasted coconut. Caboose Rider, a traditional saison, was presented as-is and in a dry-hopped variety, with apricot and blueberry renditions of a wheat beer rounding things out. Surveying the added ingredients, it's probably not a coincidence that many of the flavors used in Western Son's vodka line were also to be found in Whistle Post's initial set of offerings, but whether or not those brews or others will served on an everyday basis is still to be determined. Either way, I found the available beers to be clean, fairly well-balanced and not overly sweet as a result of the fruit infusions. Moreover, considering the heat bearing down outside, it was hard not to appreciate that each was lighter in body and easy to drink, with none boasting an ABV of more than 5.1%. As for how you can sample what Whistle Post has to offer for yourself, at least for now the brewery's beers will be available in the taproom only. That means it'll take a trip to Pilot Point to get a hold of a pint of Whistle Post beer, where the brewery plans to be open on Friday nights and Saturday afternoons. Labels: new breweries, Pilot Point, recap, Whistle Post Brewing Co.